Following the Bill Nye/Ken Ham debate, an article from Buzzfeed in which 22 creationists pose questions for people who believe in evolution has been floating around Facebook a fair bit, so I decided to answer them all. In one sentence. He teaches kids about science, so yes. I can't be scared of something I don't think exists, but it's a false dilemma because lots of believers still accept modern science – including evolution. Yes, because it conflicts with everything we've learned from multiple disciplines of science over many centuries. The 2nd law of thermodynamics states that entropy never decreases in a closed system, but the Earth is not a closed system because it has a massive, continual source of energy in the sky. 5. How do you explain a sunset if their [sic] is no God? First, see #4; second, the laws of thermodynamics wouldn't have existed before the Big Bang. Noetics are a branch of philosophy, not science, and like most branches of philosophy it's useful for framing questions but not answering them. I don't believe in an objective meaning to life, but that doesn't diminish the fact that my life is meaningful to me. Chance, or rather probability, played a role, but we don't yet know how the first single-celled organisms originated; we think they probably evolved from simpler RNA protein structures in the primordial ocean. 10. I believe in the Big Bang Theory . . . God said it and BANG it happened. Well cool, but that's not actually the Big Bang Theory. 11. Why do evolutionists/secularists/huminists [sic]/non-God believing people reject the idea of their [sic] being a creator God, but embrace the concept of intelligent design from aliens or other extra-terrestrial sources? 12. There is no in between . . . the only one found has been Lucy and there are only a few pieces of the hundreds necessary for an "official proof". As Sean Carroll says, science is not in the business of proving things; but in any case, there are countless transitional forms – Google is your friend. Evolution provides an explanation for why some animals metamorphosize. 14. If Evolution is a Theory (like creationism or the Bible) then why is evolution taught as fact? In science, a "theory" is a model that explains facts through observation and experiment – evolution and common ancestry explain the fact of modern genetic diversity. 15. Because science by definition is a "theory" - not testable, observable, nor repeatable why do you object to creationism or intelligent design being taught in school? Actually, the scientific method by definition means that hypotheses must be testable, observable, and repeatable. The most common way that information in the genome is increased is that genes are duplicated and altered. I make my own purpose, thanks. There's only one "Lucy" because it refers to a specific fossil, but there are lots of fossils of her species, australopithicus. 19. Can you believe "the big bang" without "faith"? Yes, because the Big Bang theory is supported by observation and experiment – most notably the observation of the precise degree of anisotropy in the cosmic microwave background that was predicted by the theory. 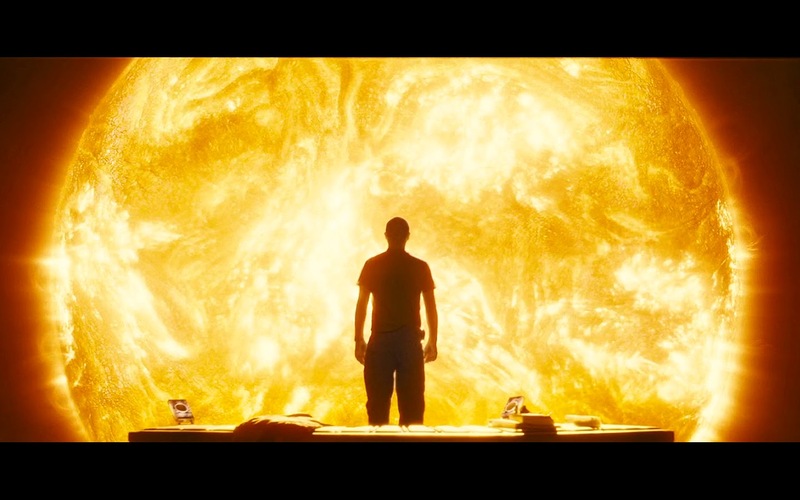 It's amazing, yes, but it's also unfathomably vast, empty, and hostile to life. 21. Relating to the big bang theory . . . where did the exploding star come from? The Big Bang refers to the expansion of spacetime from a finite point in the past, not an explosion in space. 22. If we come from monkeys then why are there still monkeys? We didn't come from modern monkeys; modern monkeys and humans share a common evolutionary ancestor. I think it's interesting that this was posed as "questions to people who believe in evolution", but it was actually a lot of questions about cosmology, abiogenesis, and atheism as well. There seems to be an assumption that if you accept evolution, you must be a God-hating atheist who believes everything came from nothing. Or something. 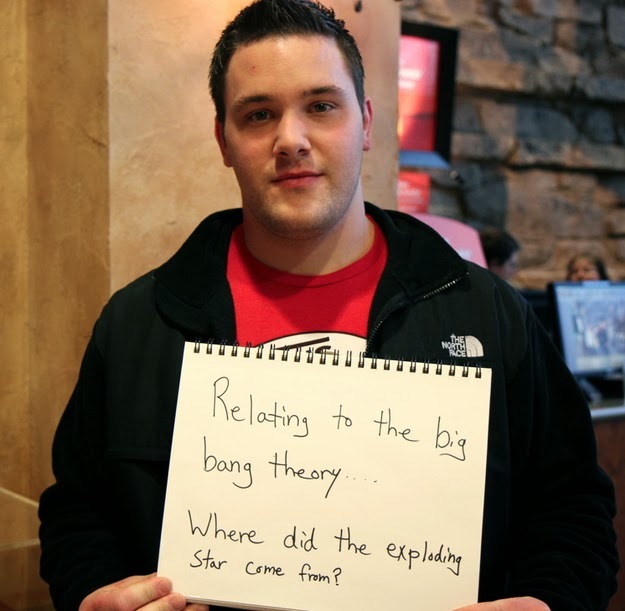 The questions show a total disconnect from reality; most of these people haven't the slightest clue how evolution, cosmology, or science in general actually works. The only thing they know about atheism is what they've been fed by people like Ham, which is to say they know nothing. The only way to think these are credible questions is to be totally insulated from critical inquiry of your doxastic community. Or, to quote Christopher Hitchens speaking to Sean Hannity: "You strike me as someone who has never read any of the arguments against your position, ever." p.s. – It looks like my partner-in-blog Bud from Dead Logic has tackled these as well, both more thoroughly and more creatively than I.